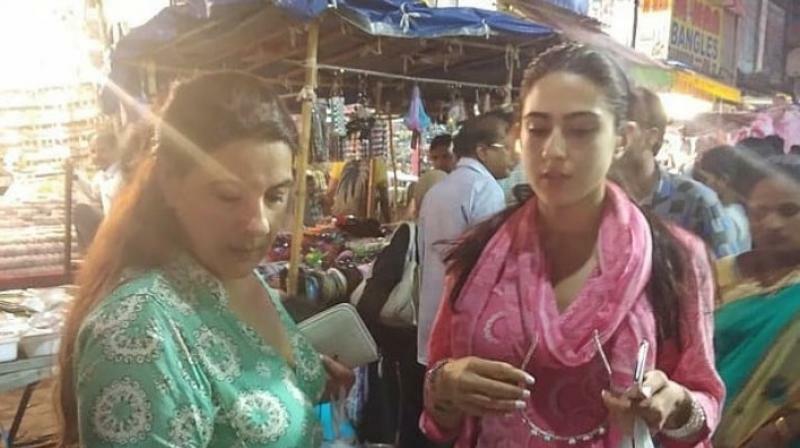 Sara Ali Khan with Amrita Singh in Hyderabad. Hyderabad: The spotlight in the last few days has been on Janhvi Kapoor as the trailer of her debut ‘Dhadak’ was unveiled on Monday. Meanwhile, another star daughter and one Janhvi is often pitted against, Sara Ali Khan, is also making headlines. Sara is currently shooting for Rohit Shetty’s ‘Simmba’ opposite Ranveer Singh in Hyderabad. And the soon-to-be-debutante decided to take a stroll around the city post shoot and went street shopping. She was accompanied by her mother Amrita Singh and a picture of the duo checking out some jewellery at Laad Bazaar is currently going viral. Since Sara is already popular and Amrita has also been in the industry for so long, it’s strange that not many noticed them, or else they could have been mobbed. We are sure that after ‘Simmba’ hits the theatres, Sara won’t be able to roam all that freely, especially in Hyderabad. The shooting of the film had kicked off few days ago, and a fun video of Ranveer and Rohit mistaking Sara for Amrita also made its rounds on social media. Sara looked convincing speaking a line in Marathi and beautiful in her ‘Basanti’-style attire. She will have another release, ‘Kedarnath’, on 30 November, before ‘Simmba’ hits the theatres on 28 December. ■Rannbhoomi: Sara Ali Khan opposite Varun Dhawan in Shashank Khaitan’s next?